Welcome to The St. Michael's PTO! Welcome to the St. Michael’s Academy PTO!! We are very excited for the 2018/2019 school year! A special thank you to Mrs. Christen Sanderson (Teacher chair) and Mrs. Jami Benson (Parent Chair) for co-chairing the PTO this year. Our PTO meetings are Quarterly. All are welcome to join us. Check back with us to see upcoming events and ways to get involved. Thank you or your participation!! Have an idea or need to contact our PTO? Send them an email: PTO@st-michaelsacademy.org. They’d love to hear from you! Spirit Night – Vertical Rock, Friday April 5th! Want to have some fun and support your PTO at the same time? Join us for the St. Michael’s Academy Spirit Night at Vertical Rock Indoor Climbing and Fitness Center. Friday, April 5th from 6 to 8. 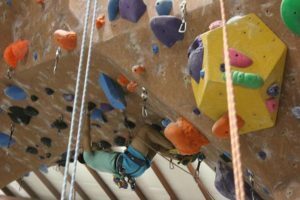 Unlimited climbs for $20/child! The address is 10225 Nokesville Road, Manassas, VA 20110. Just remember to mention to the cashier that you are there for St. Michael’s Spirit Night!!! 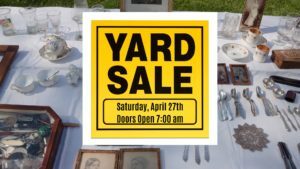 Yard Sale, Saturday, April 27! Clutter overwhelming you? Doing some spring cleaning and need a place to take those things that still can be a blessing to someone else? We can help❗️ We will be accepting community donations for our yard sale at our Vint Hill campus on Thursday, April 25 and Friday, April 26 from 4:30PM – 7:30PM. SMA families can drop items off during carpool line on those dates. Bingo Afternoon, Saturday, May 11: Sign Up Now! 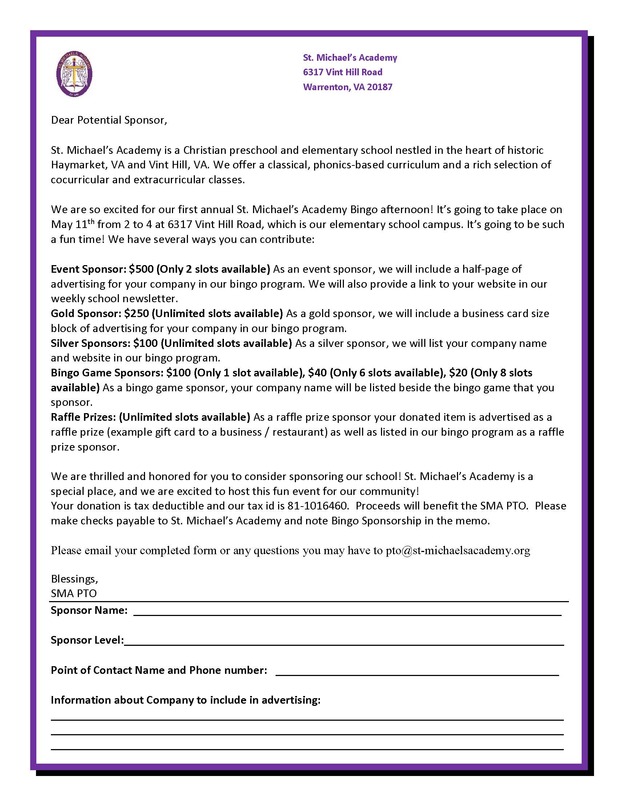 Sponsors needed for the St. Michael’s Academy first annual Bingo Afternoon to be held on Saturday, May 11th. We have sponsorship opportunities to advertise your business ranging from bingo game sponsorships ($20) to event sponsor ($500) and everything in between so we can help you find the right size for your support! Don’t have a business but feel called to help support us? No problem! Individuals can sponsor as well! For more details, click here to view our Bingo Afternoon sponsor letter.